Coral Harbour Base, (RBDF) - A joint effort by the US Coast Guard Operations Turks and Caicos (OPBAT) and the Royal Bahamas Defence Force (RBDF) on Saturday afternoon has resulted in the apprehension of 4 Dominican fishermen in Bahamian waters. A US Coast Guard helicopter operating out of Inagua under the OPBAT program reported the sighting of a 20-ft small go-fast vessel southeast of Great Inagua to the Royal Bahamas Defence Force in Inagua. Shortly thereafter, the RBDF patrol craft P-128, coxswained by Petty Officer Edison Rolle, was dispatched to intercept the vessel. The vessel was subsequently apprehended and taken to Inagua. On board the vessel were 4 Dominican fishermen along with fishing apparatus and a grouper. 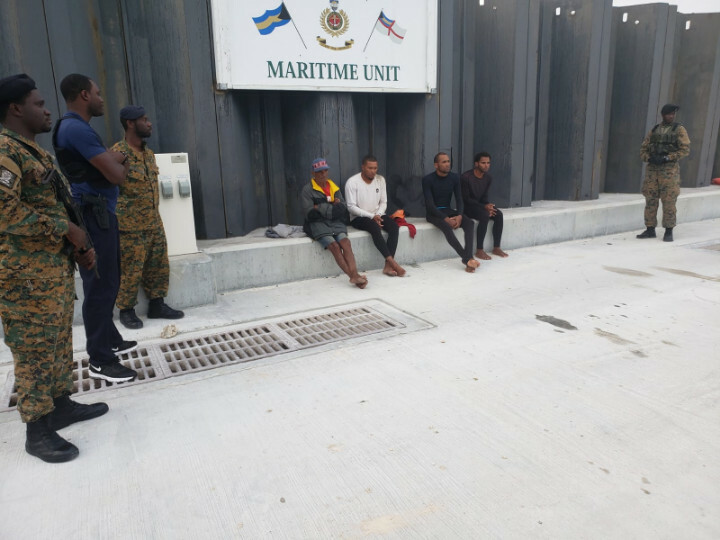 The men along with the boat and fishing apparatus were taken into custody and handed over to Police and Immigration officials at Great Inagua. On December 17, 7 Dominican fishermen were apprehended by patrol craft P-128 aboard 2 go-fast type vessel with several compressors and containers of gasoline off Great Inagua. Prior to this, on December 1, another 7 Dominican fishermen were apprehended by patrol craft P-128 off Inagua with over 300 pounds of fish. The poachers have since been charged before the courts on several counts resulting in sentences up to 9 months and $413,000 in fines.